Video clip synopsis – Violet Teague and Jessie Traill were part of a remarkable group of independent women who, in the early 20th century, were able to devote their lives to art. Broadband MP4 hidden7_bb.mp4 (17.4MB), suitable for iPods and computer downloads. Violet Teague & Jessie Traill is an episode of the series Hidden Treasures (15 × 5 mins) produced in 2006. During the first two decades of the 20th century there was a spirit of emancipation among Australian women. Many now saw art as a viable career, enrolling in art schools across the country. Violet Teague and her friend Jessie Traill were part of a remarkable group of financially independent, middle-class women who never married, allowing them to devote their lives to art. From an early age both women travelled regularly overseas, which put them in touch with international trends. Jessie Traill’s hand-coloured aquatint The Red Light, Harbour Bridge, June 1931 shifts the emphasis of etching from the intimate to the dramatic. It owes more to the etching revival in Europe than the brightly coloured wood and lino block prints popular in Australia in the 1930s. Violet Teague’s handprinted children’s book Nightfall in the Ti-Tree, which she made with Geraldine Rede in 1905, uses handmade recycled paper made to look like Japanese mulberry paper and Japanese methods of binding and applying water-based ink with a brush. Even the asymmetrical placement of objects on the page is Japanese. 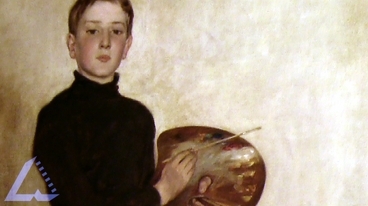 In 1920, Teague’s portrait The Boy with the Palette was exhibited in the Paris Salon, where it won a silver medal, and in the following year it attracted acclaim at an exhibition at the Royal Academy of London. It’s a splendid painting, equal to any portrait painted in Australia before World War One, and Traill’s etchings too hold their own. So why are both artists seldom mentioned in the story of Australian art? Perhaps because they were women, but more likely because Teague interrupted her career to look after an ailing father. And also because the independence of both women enabled them regular trips abroad, which meant they were more in touch with artists and art movements there than at home. Research and write a brief biography for both Jessie Traill and Violet Teague. Research and discuss how the era in which both Jessie Traill and Violet Teague lived influenced and inspired their artworks. Compare and contrast Jessie Traill’s and Violet Teague’s prints. For example, do they share any qualities or visual styles? By looking at the selected artwork of both artists in the video clip are you able to interpret the artistic identity each artist achieved? Write your impressions of how these artists saw themselves and their world. Research then discuss why both artists are seldom mentioned in the story of Australian art.